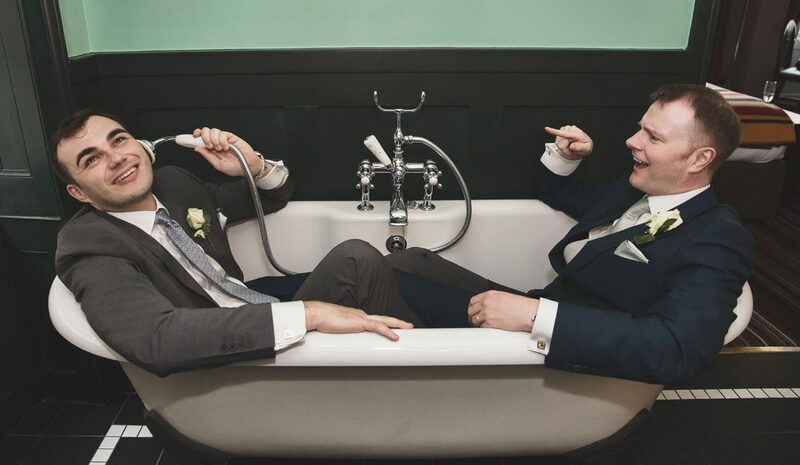 Two grooms in a bath at the Zetter Town House Hotel in Clerkenwell? 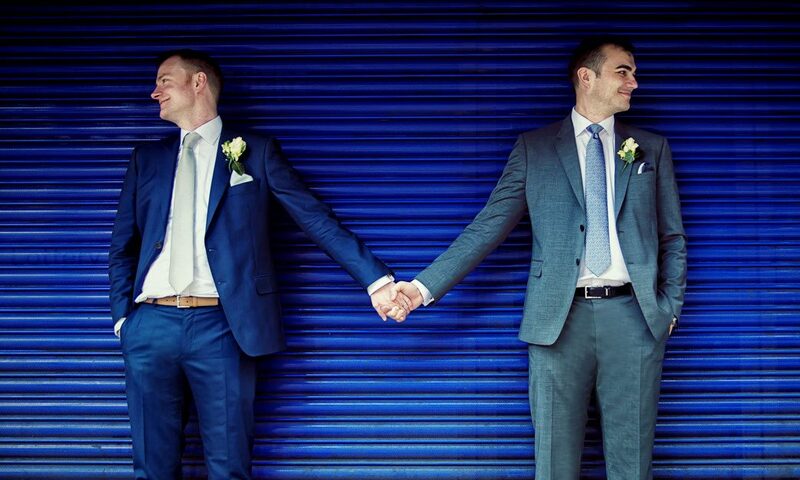 This can only be a quirky London wedding day! 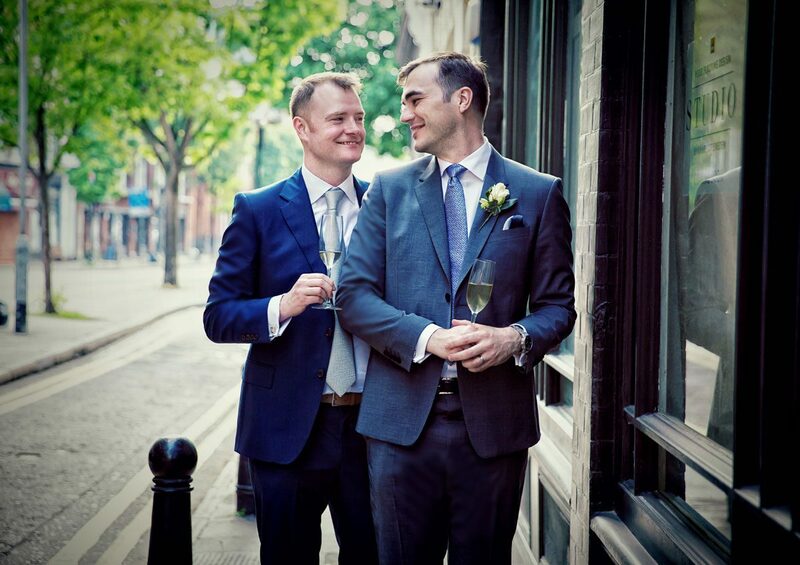 Dean and Johannes came to us on recommendation from couple Julie and Ed’s big day at Southwark Cathedral, and reception at the now closed and sadly missed wine and event venue Vinopolis. 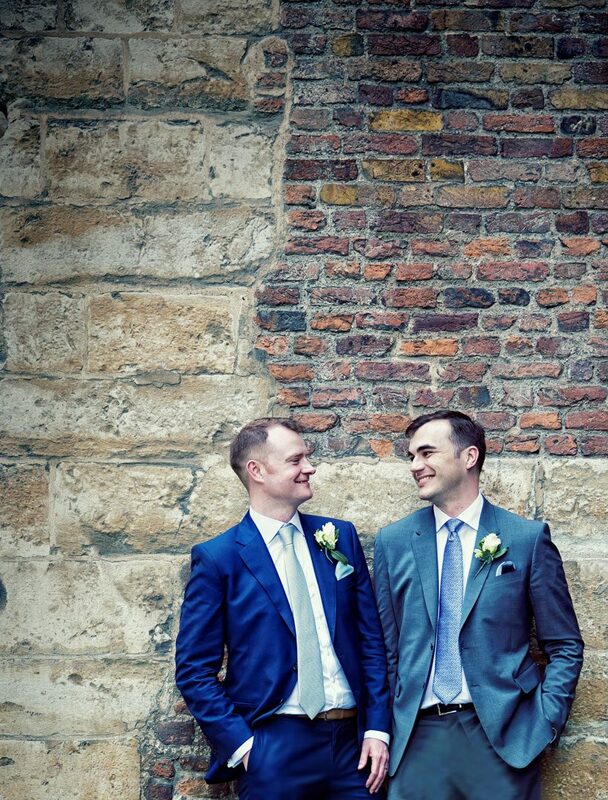 They had seen the way we worked and the images from that lovely day so they booked us with confidence. 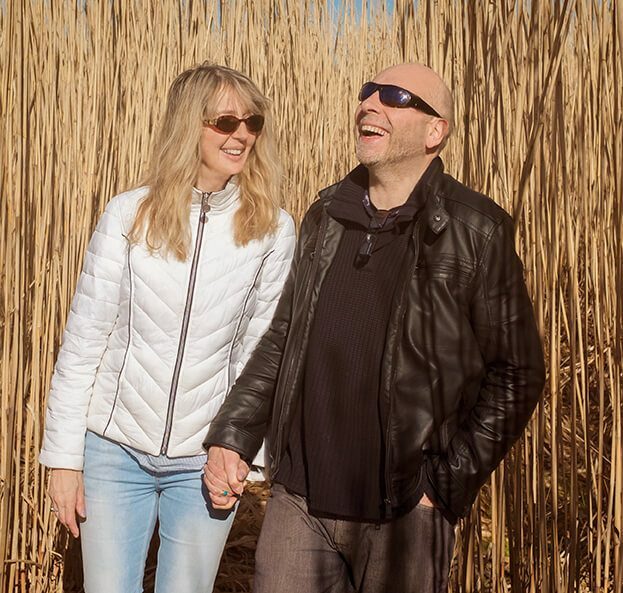 We didn’t have a great deal of communication beforehand, but as we knew what they were looking for and we had worked at all the venues previously that was no big deal. I love that fact that the boys pretty much got themselves ready in front of Hackney Town Hall itself while they waited for guests to arrive. Seriously, only men would do that! 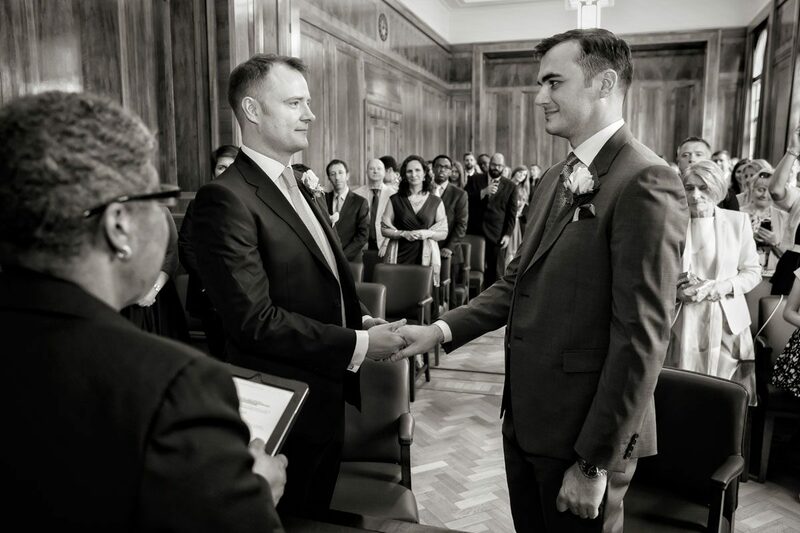 The main council chamber is being refurbished, so the ceremony itself was held in a fantastic alternative wood panelled room and was the perfect size for the boy’s wedding party. A special mention to the registrars on this day, who we found to be both sensitive and enthusiastic, and they really added to the occasion. 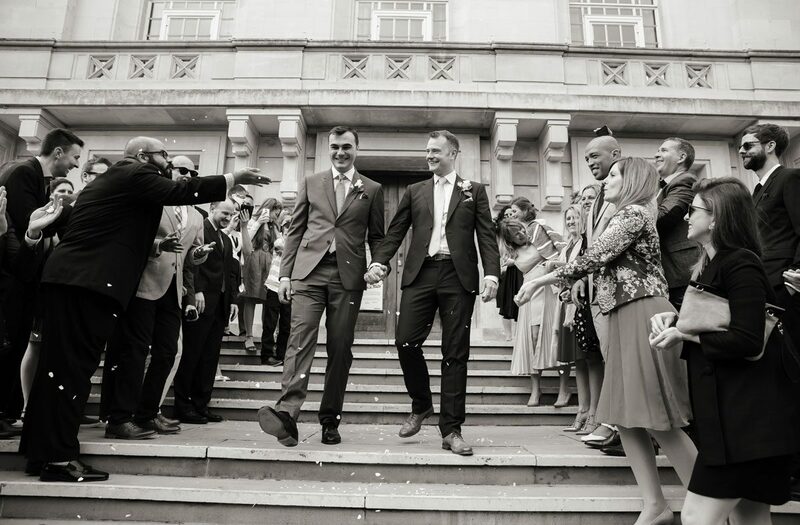 Once married Dean and Johannes had a receiving line outside the town hall and then a confetti throw on the steps at the front. 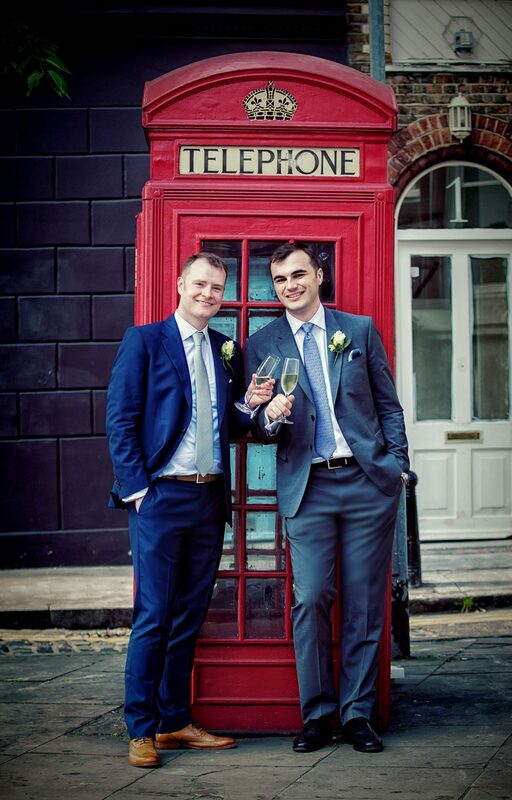 Two vintage London red routemaster buses were waiting to take the wedding party on a magical mystery tour, both loaded with the finest champagne on tap. How these bus conductors manage to pour drinks on a 1950-60’s bus with that suspension is beyond us! It’s a skill for sure. We stopped briefly for a mass visit to the fantastic City of York pub in Holborn, before returning to the routemaster sight seeing tour through central London landmarks. I sat there spotting all the venues and areas we had photographed in. It was a lot! Well travelled now we arrived at the Zetter Town House Hotel for the canapés and drink reception. This was actually held in the lovely and atmospheric St John’s Museum Gardens nearby. 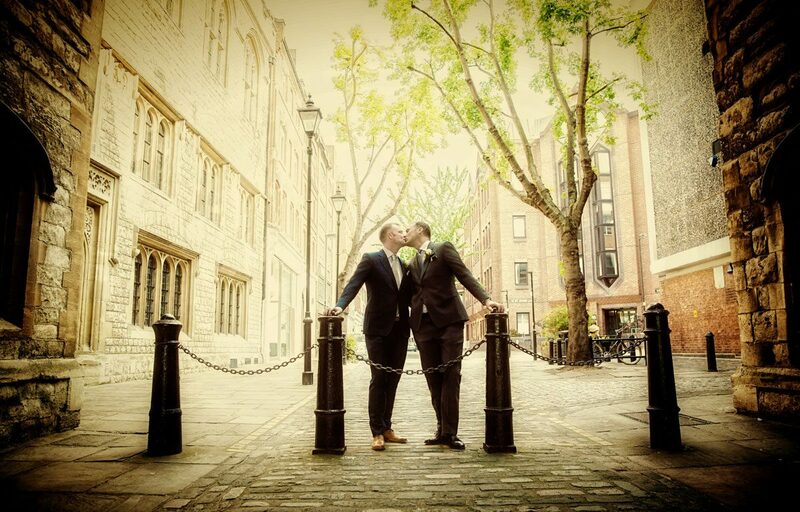 I managed to grab fifteen minutes during this to take the grooms around the block for some couple shots before returning for the speeches in the gardens. During this time Joanna did some reportage coverage of the guests generally having a very good time indeed. All speeches were entertaining and well delivered, and once those were done the wedding party made their way across the courtyard to the Zetter for the evening reception. Once more drinks and canapés were served in abundance and Dean and Johannes cut their cake and socialised the evening away. As you can see from the first image they also had time to take a dry bath together!